Shotguns are a little bit different than pistol lights and rifle lights. First off, a shotgun puts a considerable amount of stress on the light. Certainly much more than a pistol and even more than AR. Secondly, if you’re not careful you can end up with a hand that feels like it just got put through a cheese grater. To be brief, when you’re looking for a shotgun weapon light you’re going to want to make sure it’s incredibly durable (for those that have read my UTG 2-in-1 rant know I’m a big believer in durability) and second you want to make sure the comfort is there. The best tactical shotgun lights on the market are unquestionably the DSF series made by Surefire. The Surefire shotgun series is an expensive product, but having the skin on your hand still in one piece and the light still functional after firing off a few rounds will make it worth the extra money. Durability:- The best reason to purchase a fore-end shotgun light and not the amount is durability. Equipping a mount and then adding a tactical flashlight onto that mount can lead to having to constantly make minor adjustments. Anytime you add more parts, you add more parts that can break or come loose. 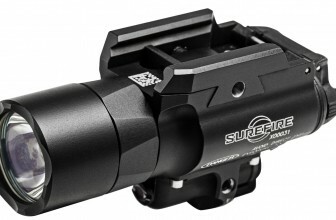 Surefire has always built high-quality products and their shotgun lights are no different. They’re expensive, but they’ll last you forever. I’ve had Surefire light equipment from years ago (7 to be exact), when it finally did break Surefire sent me replacement parts despite the model being discontinued. Lumens:- One of the best ideas that Surefire had when designing the DSF shotgun series was to install two levels of lighting. When you have the low setting switched on it puts out 200 lumens. When you flip it to high, it cranks out a whopping 600 lumens. Enough to light up a dark forest. 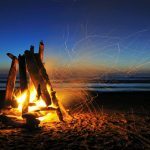 Some might ask why you would want the 200-lumen setting? Why not always use 600 lumens. Indoors 600 lumens might be a little too much, it’s a whole lot of light. 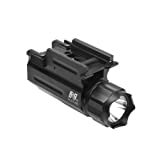 I’m sure when they were designing this product Surefire was thinking; we need an intense light for tactical squads and other operations, while the 200 lumens would serve perfectly to protect your home. On/Off Switch and Battery:- As usual, Surefire spent more than a few minutes designing theirs On/Off switches. It features a long pressure activated the switch and a constant on or off switch which is located in a convenient location. All four DSF models include two CR123A batteries. The runtime on this unit is 3 hours. The Surefire Series fits a wide variety of shotguns. The four separate models are the Benelli M1/M2, Winchester 1200/1300/Super X Pump Defender, Remington 870 and of course my personal favorite the Mossberg 500/590. Overall there isn’t a better shotgun light on the market. With its wide variety of models, the DSF series covers almost every model. It’s certainly an expensive investment and many might prefer to spend less by purchasing a weapon mount on their shotgun, such as the Elzetta Shotgun Mount. On Amazon, the DSF series scored a solid 5/5, although the number of reviewers is thin.